Victorinox Swiss Army is one of the most highly regarded and sought-after luxury brands in the world today, popular for its travel goods, apparel, wristwatches and cutlery. The brand was founded in 1884 by Karl Eisener, who opened a cutler’s workshop in Ibach-Schwyz, Switzerland offering premium pocket knives and other cutlery. In 1891, the Swiss military commissioned Eisener to produce pocket knives for soldiers in their armed forces. As a result, the “Swiss Officer’s Knife” and “Sport Knife” were registered to Eisener’s Association of Swiss Master Cutlers in 1897. After the death of his mother in 1909, Eisener named the company Victoria in her honor and developed the brand’s cross and shield emblem in red and white. With the development of stainless steel in the cutlery industry in 1921, Eisener incorporated the international term for stainless steel: inox into the brand name, creating the Victorinox brand. Victorinox pocket knives and cutlery flourished throughout Europe in the years that followed and the company became a global force after World War II. In 1989, Victorinox Swiss Army expanded its product line with wristwatches featuring the same high-quality, surgical grade stainless steel used in their popular knives, along with premium Swiss-made ETA movements inside and 12/24 hour military time on the dials. You’ll find many of these military inspired watch styles at the Victorinox Swiss Army Top-Sellers Event taking place at TheWatchey.com this week. Popular men’s and women’s watch models are featured in the promotion, including styles from the Alliance, Officer’s and Infantry collections. 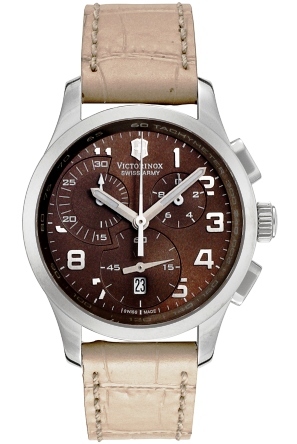 The Victorinox Swiss Army Officer’s watch in two-tone stainless steel is a top-ranking choice for today’s man. This outstanding Swiss-made timepiece features the rounded, contoured stainless steel case in a satiny brushed finish and the brushed stainless steel link bracelet with polished yellow gold-tone stainless steel accents. The perfectly round, polished yellow gold-tone bezel encircles the metallic blue dial with luminous skeleton hands and 12/24 Arabic numeral hour markers. Features include an automatic date window at the 6 o’clock hour and scratch-resistant sapphire crystal above the dial. Officer’s watch is 40mm in diameter, 9mm thick and is water-resistant to 100 meters or 330 feet. 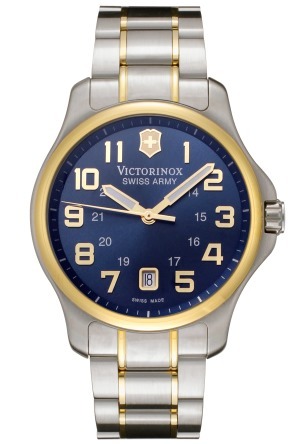 The Victorinox Swiss Army Alliance chronograph is a sleek and stylish choice for women. This casual contemporary women’s watch features the perfectly round case in highly polished stainless steel, presented on a crocodile-textured beige leather strap. The integrated bezel surrounds the brown dial with three sub-dials, luminous hands, Arabic numeral and baton hour markers. Features include an automatic date window, 1/10th of a second, small-second and 30-minute registers. Alliance women’s chronograph is 34mm in diameter, 11mm thick and is water-resistant to 100 meters. 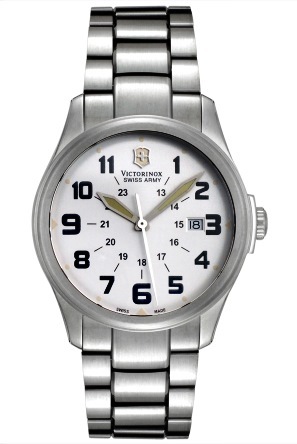 The Victorinox Swiss Army Infantry Vintage watch is another excellent choice for men. This masculine and appealing timepiece features the contoured stainless steel case with a smooth, brushed finish, presented on the attractive triple link bracelet in brushed stainless steel with a fold-over clasp for added security. The round stationary bezel surrounds the bright white dial with luminous skeleton hands and black 12/24 Arabic numeral hour markers. A window at the 3 o’clock hour reveals the automatic date calendar. Features include a scratch-resistant sapphire crystal above the dial and water-resistance to 100 feet. Infantry Vintage watch is 38mm in diameter and 10mm thick. The Victorinox Swiss Army Alliance Sport watch is sleek, sporty and ideal for today’s active woman. This casually elegant women’s watch features the satin finished brushed steel case presented on a triple-link bracelet in brushed and polished stainless steel with a push-button deployment clasp for added convenience. The unidirectional rotating bezel with a screened black top ring surrounds the black dial luminous hands and 12/24 hour markers. A window at the 6 o’clock hour reveals the automatic date calendar. Features include a scratch-resistant sapphire crystal above the dial and water-resistance to 100 meters. Alliance Sport women’s watch is 33mm in diameter and 9mm thick. 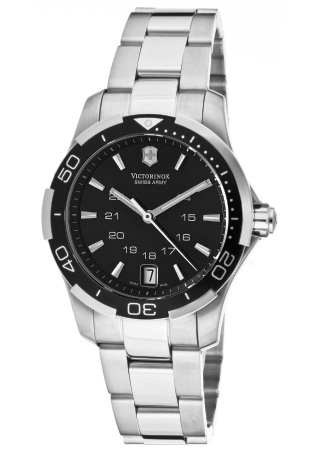 Each Victorinox Swiss army watch featured on this page has premium Swiss-made quartz movement inside for precise time-keeping accuracy.